Copywriter | Portfolio | Direct Mail . Written on behalf of an entertainment management company, this marketing letter had to quickly introduce the company and its services to a database of potential clients, then open up the possibility of future contact. Event managers of several dozen companies in the South of England. The voice of late-night BBC? No, that could be you on the stage. 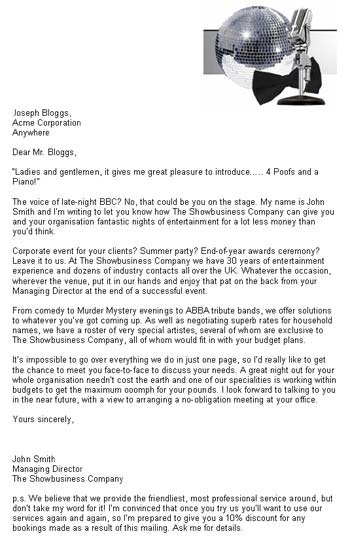 My name is John Smith and I’m writing to let you know how The Showbusiness Company can give you and your organisation fantastic nights of entertainment for a lot less money than you’d think. Corporate event for your clients? Summer party? End-of-year awards ceremony? Leave it to us. At The Showbusiness Company we have 30 years of entertainment experience and dozens of industry contacts all over the UK. Whatever the occasion, wherever the venue, put it in our hands and enjoy that pat on the back from your Managing Director at the end of a successful event. From comedy to Murder Mystery evenings to ABBA tribute bands, we offer solutions to whatever you’ve got coming up. As well as negotiating superb rates for household names, we have a roster of very special artistes, several of whom are exclusive to The Showbusiness Company, all of whom would fit in with your budget plans. It’s impossible to go over everything we do in just one page, so I’d really like to get the chance to meet you face-to-face to discuss your needs. A great night out for your whole organisation needn’t cost the earth and one of our specialities is working within budgets to get the maximum ooomph for your pounds. I look forward to talking to you in the near future, with a view to arranging a no-obligation meeting at your office.